MATTHEW 26:41 KJV "Watch and pray, that ye enter not into temptation: the spirit indeed [is] willing, but the flesh [is] weak." 38Then saith he unto them, My soul is exceeding sorrowful, even unto death: tarry ye here, and watch with me. 39And he went a little further, and fell on his face, and prayed, saying, O my Father, if it be possible, let this cup pass from me: nevertheless not as I will, but as thou wilt. 40And he cometh unto the disciples, and findeth them asleep, and saith unto Peter, What, could ye not watch with me one hour? 41Watch and pray, that ye enter not into temptation: the spirit indeed is willing, but the flesh is weak. 42He went away again the second time, and prayed, saying, O my Father, if this cup may not pass away from me, except I drink it, thy will be done. 43And he came and found them asleep again: for their eyes were heavy. 44And he left them, and went away again, and prayed the third time, saying the same words. Watch and pray, that yee enter not into temptation: The spirit indeed is willing, but the flesh is weake. Keep watch with prayer, so that you may not be put to the test: the spirit truly is ready, but the flesh is feeble. 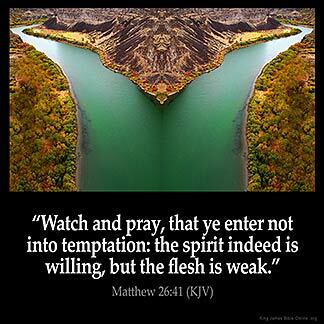 Watch and pray, that ye enter not into temptation: the spirit indeed [is] ready, but the flesh weak. Keep awake, and pray that you may not enter into temptation: the spirit is right willing, but the body is frail." Wake ye, and preye ye, that ye entre not in to temptacioun; for the spirit is redi, but the fleisch is sijk. 26:41 The spirit - Your spirit: ye yourselves. The flesh - Your nature. How gentle a rebuke was this, and how kind an apology! especially at a time when our Lord's own mind was so weighed down with sorrow. Mt 26:41 Watch and pray, that ye enter not into temptation. Our Lord does not direct them to pray to God that no temptation might befall them, but that they might not be overcome by the temptations in which they must be involved. The need of such prayer was shown by Peter's denial. I am either going to serve my flesh or I am going to serve Spirit of living God within me. Unless I pray I will be yielding to my flesh : It is not a sin to be tempted : It is sin to submit to it. I also will not be tempted with a thing that I do not like. A temptation is when I really like doing that !!!!! Praise God : God makes a way of escape through Jesus Christ : he was tempted with what I face and overcame : so also I overcome !!!! Yes : Amen !!!! The more you feed the spirit with the Word of God, the harder it is to fall. How we feed our minds will reflect on our walk with the Lord. Always praying for others that are going thru tribulations.